Eric Peters: "People Assume That Stocks Always Rise Over Time. They're Wrong"
This week on the MacroVoices podcast, host Erik Townsend welcomed Eric Peters, the CEO and CIO of One River Asset Management, for a discussion about the long-term future of the US economy, and how demographics, the expanding US debt, and the waning influence of central banks will impact growth, inflation and - most importantly - markets. After a brief discussion about the future of USD hegemony, and the factors that could lead to the dethroning - so to speak - of the dollar, the two plunged into a discussion about one of the most vexing issues of the modern US economy: Why sub-4% unemployment hasn't driven a runup in inflation back toward levels witnessed before the financial crisis. If the central banks have been the ones who have gotten us here, they just – by definition – they’re not the ones that are going to get us out of here. So I think – look, we’re always going to look at what central banks are doing, they will be important. But I think that they’re no longer going to be dominant. What’s going to be dominant are the politicians. You’re seeing that in the US right now. I know that everyone loves to hang on every word that Powell speaks. And they look at the Fed statement. And people are still trained to look at the Fed dot plots (which are probably going to go away). People are trained to look at all of these things because that’s what they’ve done their whole careers. But they just are not going to matter that much anymore. Whether the Fed’s terminal rate is 2.25 or 2.5 or 2.75 – we’re not talking about much. What are we going to do in terms of immigration policy? What are we going to do in terms of trade policy? How is that going to impact all of the major corporations’ global supply chains? These are the things that are really going to matter. With the interview drawing to a close, Townsend asked for Peters' thoughts about the popular macro view that shifting demographics (aka a shrinking population) will deliver long-term deflation, and a secular bear market in equities. In theory, fewer consumers equals less demand for goods (and financial securities). But Peters believes the opposite is just as likely: That Millennials and Generation Z will face a spike in inflation as the stock of consumers outpaces the stock of workers. But as you really start to age, what happens is the labor force shrinks dramatically (in this really simple society), the retired pool expands rapidly. All of a sudden you have a lot of demand because, while the older people may be consuming less than when they were actively working, they’re still consuming. And you have very few workers left. And, ultimately, in that society you end up with huge inflation in the price of labor, whether it’s for producing goods at a factory or for services. You ultimately end up with all the old people exchanging all of their financial assets and their homes for even the most basic services. I kind of joke, the last person will exchange their house for one last diaper change. And that’s – if you take it to the extreme – that’s kind of what that society looks like. Peters devoted the final minutes of the interview to dispelling the notion that, over time, equity prices always move higher. One result of Japan's decades of deflation and economic stagnation is that the Nikkei is - in nominal terms - unchanged since 1987. Okay, really high-level. People assume that equities always go up. And they certainly have been for an awful long time in the US. But they can go through really long periods of sideways movement. If you look at the NIKKEI – I started my career in 1989. 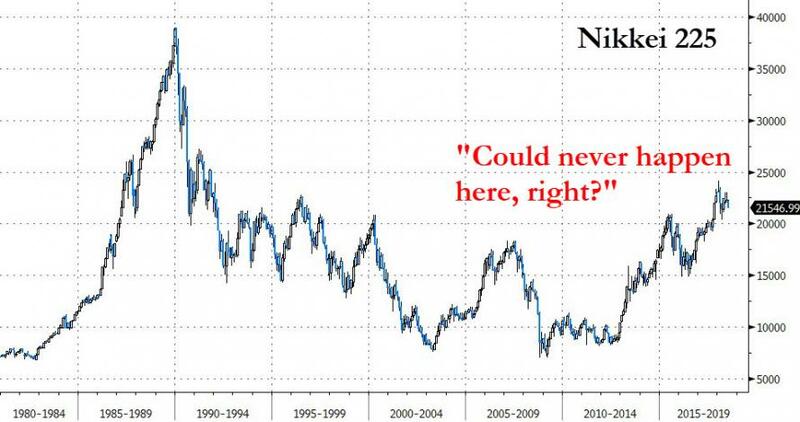 The NIKKEI today, in nominal terms, is where it was in 1987. It’s where it was before I started my career. It’s moved sideways during that period. The S&P is up over 800% in that period of time. So we’ve outperformed the NIKKEI from 1987 by over 800%. Euro Stoxx, European, their big equity index, it is unchanged from where it was in 1998 – 20 years ago. We’re up 130% during that period of time, the S&P 500. And the Shanghai Composite is unchanged from where it was in 2006, at this point. So it’s unchanged over the past 12 years, despite the enormous real and nominal GDP growth out of China. Their equity market is flat for 12 years. We’re up 90%. So it’s just a reminder that we go through these periods of assets doing extremely well – pricing in all kinds of robust growth for the future – and then periods where they can obviously have big corrections, but even over long periods of time they can just move sideways.